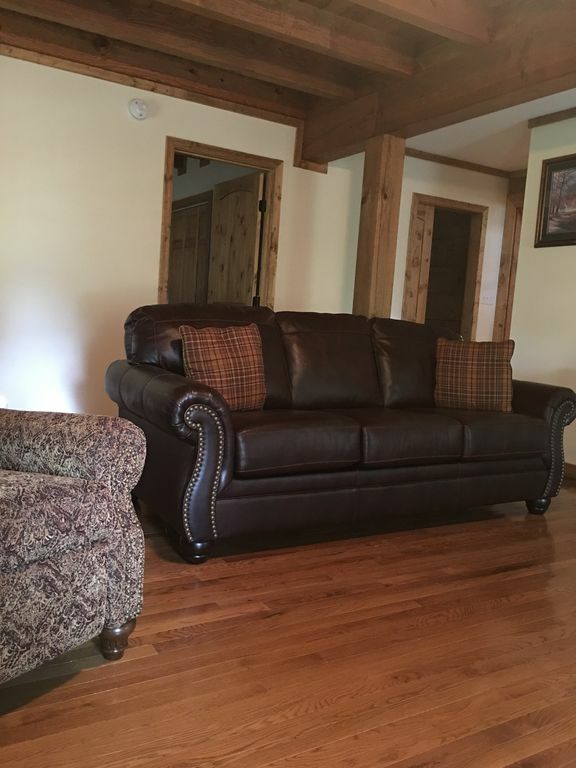 Baskins Creek Sounds is our unique log 'home away from home' that we make available to those who are looking for a relaxing setting. Note: **The original cabin burned in the 2016 wildfires. The new cabin is very similar to the one that we enjoyed so much. The pictures posted are of the new cabin which is finally finished. Please see the facebook page baskins creek sounds for updates on the cabin. Gatlinburg, Tennessee is a small mountain town bordering the Great Smoky Mountains National Park. Our place is within easy walking distance to the center of town (why pay for parking?) and a few miles to the Arts and Crafts loop. Walk right up the street and into the The Great Smoky Mountains National Park. Pass a gorgeous waterfall approximately 45 minutes away and if you really like to hike, keep going and connect with other National Park trails such as Trillium Gap, Cherokee, Roaring Fork, Mount Le Conte, Rainbow Falls and of course, Baskins Creek Falls. We have approximately 200 feet of beautiful Baskins Creek running through our front yard so if you're not a hiker you can enjoy the sights and sounds of mountain stream without leaving the property. The house has three (3) large bedrooms--- two (2) up and one (1) down and 2 full baths. Includes a king, a queen, and full bed with a bunk, as well as a queen sleeper sofa. New living room furniture looks great on the hardwood floors. All total, you can enjoy any of three televisions, with cable. We will keep a small stash of DVDs, as well as a well stocked bookshelf as soon as I am able to get this replenished. The kitchen/dining area is 20’x18’ with an open beam cathedral ceiling of knotty pine. This room features a ceiling fan and an island wet bar with two stools. Seat eight comfortably at the dining table. The children's corner features a table and chairs for two. The kitchen is equipped with a coffee maker, toaster oven, electric range and microwave, as well as enough cookware to make a cooking family happy. Through the side kitchen door is our large porch with an additional table for four, a couple of unique chairs and a lounge where you can let the creek lull you into a refreshing nap. Just outside the porch is a charcoal grill, for your steaks, dogs and burgers and of course, s'mores. The yard is an experience all its own. Apart from the house most of this beautiful half-acre survived that fire and is filled with unique flowers, trees, and shrubs, all in a delightful series of garden 'rooms' sure to please any nature loving taste. It is doubtful that anyone can identify every plant in the yard but you owe it to yourself to try. There are plenty of places to sit and be still, pray, or just enjoy the quiet. A most charming way to enjoy the yard is to park yourself on the 30’ front porch where you can swing, rock, or commune with the birds as you enjoy your coffee or tea. Great for a family retreat, girlfriend's weekend, wedding or a honeymoon. To us our home is about relaxing with family and good friends. We hope you'll find the same is true for you and yours. Come see us soon! Owners live in Mansfield Ohio and Atlanta Georgia. Enjoy hiking, shopping and the amenities the area has to offer. We have been coming to this area since I was a child. We have stayed in multiple types of accommodations. We rented this cabin on a quick weekend get away and the whole family fell in love with it. Lucky us.....it was for sale ! The location can't be beat. It is so close to everything but maintains it's privacy. The 1/2 acre yard is beautiful and you can enjoy it from the swing on the front porch. I had my son's senior pictures taken in the front yard. The mountain views can be enjoyed but without any hazardous roads to contend with. It is a unique property with things to offer for everyone in your group. Off street parking. Newly paved driveway. Hope to get the library rebuilt. Very nice cabin. Close to the main road, says its walkable but probably not with small children, it's a little over a mile. The cabin had everything you would need. It's very clean and the beds are super comfortable. Cabin was clean and roomy. Everything we needed was there. We didn’t have any issues that we needed to contact the owner with. Everything was as described on the site. The cabin is nicer than the pictures on VROB. I would suggest looking at the Facebook site to see better pictures. We enjoyed our stay and would recommend to others. We're so pleased you liked our cabin and had a good time. Thanks for such a nice review. We are hoping to get more photos up in the Spring, when the yard will have recovered from the construction. I hope you'll think of us the next time you're in the area. You were a great guest. Plenty of room and stocked well with dishes etc in the kitchen. Loved the fireplace and porches. Just a great trip. The cabin is very special to us, so I'm delighted to hear that you liked it. Thanks for staying with us. The cabin was wonderful and it's location couldn't have been better! Can't wait to return! We'll look forward to hosting you in the future. So glad you had a good time. Thanks, Freddie. Glad you enjoyed our place. The cabin was very nice. So close to town but felt like we were far away from the crowds and noise. Very pleasurable getaway. So glad you enjoyed the cabin. I hope you'll consider staying with us in the future. Close to downtown tourist area of the Great Smoky Mountain National Park. Aquarium, hiking, shopping, restaurants, arts and crafts village, skiing theme parks nearby. Rates are subject to change until reservation is confirmed. Cleaning fees included.